A New Catalyst in the Geopolitical Dynamics of the Gulf? 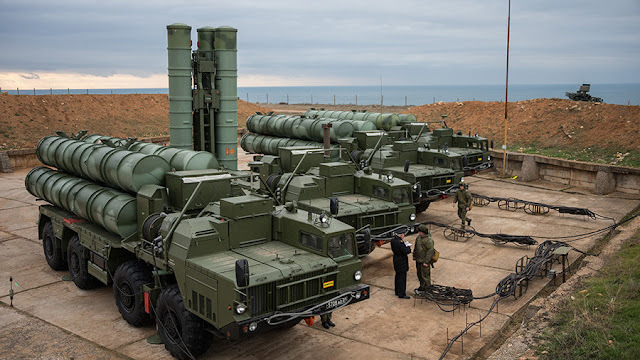 On July 21, TASS news agency, a leading Russian news source quoted the Russian Ambassador to Qatar, Nurmahmad Kholov of a potential sale of the advanced Russian Air Defense (AD) system, S-400 "Triumf" to Qatar. The Russian official did not further specify the details of the progress of the deal. This incident was preceded by a letter from the Saudi Crown Prince Mohammad Bin Salman to the French President Emmanuel Macron specifying his intent to launch military strikes if Qatar deploys the S-400’s. However, no official statement on the issue has been made by either the Saudi or the French governments at the time of writing. The incident follows a few months after Qatar announced its intention to buy the advanced AD system from Moscow and that the talks are in ‘advanced stage’ of development. Following the threat, Russian news agencies have reportedly quoted official government agencies stating that they were going ahead with the sale of the AD system despite the warnings by Riyadh. Qatar initiated a verbal duel with Riyadh on the issue of procurement and induction of the system and called it a matter of sovereignty, thus making it non-negotiable. The prevailing geopolitical and operational condition in the region is significant in light of the continued economic blockade of Qatar by the Arab quartet comprising of Saudi Arabia, UAE, Bahrain, and Egypt. Keeping that in mind, this report evaluates the potential fallouts of the deal on the regional geopolitical and military balance in the region. A Media Stunt or an Impending Action? At the time of the implementation of the blockade on Qatar on June 5, 2017, there were rumors of Riyadh and its allies potentially planning a coup or limited intervention in Qatar to further pressurize Doha to relent to its demands. However, the conflict was limited to accusation and counter-accusation in addition to the enforcement of the economic blockade, while the military remained in their respective barracks. However, the military build-up by Qatar in recent years, both preceding and succeeding the blockade, hints towards Doha’s intention to deter a potential, albeit a limited external attempt to hamper its internal security or even engineer a coup d'etat against the al Thani leadership. Irrespective of the Saudi intention, the events have triggered a chain of consequences that has not only resulted in a notable uptick in Qatari defense imports but also deeper economic and military engagements of Doha with Turkey as well as the U.S. This is likely to further ensure security guarantees for Qatar, which were not so rigidly enforced in the days preceding the economic blockade. Qatar is estimated to have procured defense-related equipment worth roughly US$ 25 billion. Most of it was reportedly sourced from U.S. (67 percent) and European countries. According to SIPRI, Qatar procured "36 combat aircraft from the USA, 24 from the U.K. and a further 12 from France in 2017. The 2017 deals were concluded soon after tensions surfaced between Qatar and several Arab states, led by Saudi Arabia and the UAE". These purchases are viewed from the purview of a parallel political investment to gain greater support in case of a conflict with Saudi Arabia. Apart from the surge in defense procurements, Qatar had also discussed its intention of joining the NATO, which was immediately shot down by the military union comprising European nations and the US. This highlights the heightened sensitivities of the Qatari government to potential threats emanating from Saudi Arabia. It also provides a rationale for the surge in the deployment of Turkish troops in Qatar, which is likely to act as deterrents against any Saudi or Emirati military ventures. Currently, the Qatari defense forces continue to field the US-built Patriot Air Defence System, a similar system has also been deployed by Saudi Arabia, thus achieving a degree of parity in military capabilities. Furthermore, Saudi Arabia along with its regional partner UAE continues to remain the largest defense importer and maintains a military edge in terms of technology and manpower over its GCC neighbors. Qatar, prima facie, lacks strategic depth and can be targeted by virtually every military platform in the Saudi and Emirati arsenal. Therefore, the potential sale of S-400s to Qatar by Russia is estimated to enable Doha to be better placed in defending its airspace against any hostile aerial incursion by Saudi Arabia and UAE, thus, at least partially, stemming the superiority in conventional military capabilities of its adversaries. 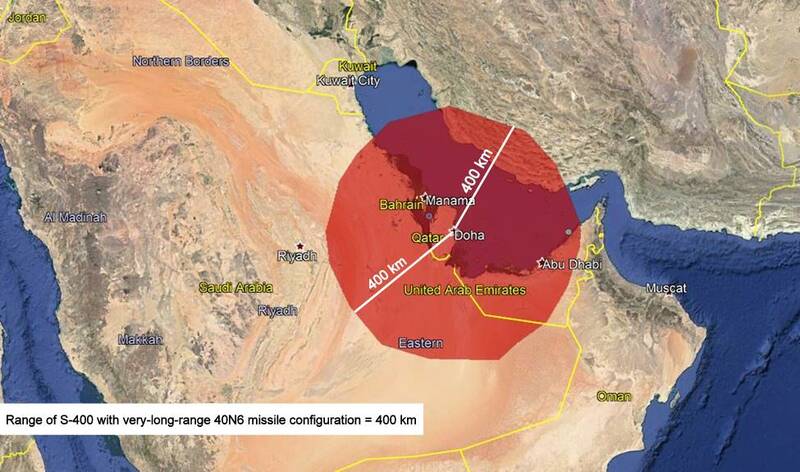 A review of the area covered by an S-400 system deployed in Doha indicates that it has the potential to cover the whole of Bahraini airspace alongside a majority of western UAE and large swaths of eastern Saudi Arabia. A successful deal and deployment thus hold potential to serve as a credible deterrent if used in a defensive set-up. The popularity of the S-400, which was inducted into the Russian service in 2007 increased significantly after its deployment to Syria in 2015. Since then, multiple countries including China, India, Saudi Arabia and Turkey have shown interest in the system. However, open source data indicates that the system has not been deployed in any of the aforementioned countries, with projects in different stages of development at the time of writing. In the case of Qatar, the statement indicates that the deal is still in the negotiation stage and will take a few months to years at best to be delivered. Moreover, like other Gulf neighbors, Qatari inventory has primarily been of Western (US and European) origin highlighting the potential compatibility issues of the S-400s, a Russian origin equipment into the existing air defense grid. Russia, according to SIPRI, has contributed to roughly US$ 4 million worth of equipment to Qatar, primarily small arms and other squad-level weaponry, including machine guns, grenade launchers, Anti-Tank Guided Munitions (ATGM’s) among others. This is likely facilitated by the military cooperation pact signed in 2017. However, any major procurement of strategic weapons early in the renewed military partnership remains highly questionable. Finally, the imposition of the Countering America’s Adversaries Through Sanctions Act (CAATSA) on Russia is likely to compound the impediments to the potential sale of the AD system to Qatar, as Doha stands the risk of attracting US sanctions for violation of the aforementioned act. Given the importance of the US-Qatari relations, Doha is likely to factor its decision at least for the time being. It thus provides Saudi Arabia a greater opportunity to pressurize Qatar in relinquishing its decision through powerful pro-Riyadh lobbies in the US. The diplomatic pressure thus seems more likely to be the preferred means used by Saudi Arabia over military means. This will also lead the Qatari leadership to contend with the security guarantees offered by the Turkish and American troops presence in this small Arab state at least in the short-to-mid-term.